Hi, just found your blog, and look forward to recipes that work! I was diagnosed more than 8 years ago and am still working on bread. Lots of recipes are out there--none so far has had the perfect combination of texture, flavor, and healthiness that I'm looking for. I tweak and tweak, and sometimes hit it just right, then can't duplicate the success. I like Trader Joe's brown rice pasta. It's cheap ($2 per one pound package), tasty, and made from organic brown rice, which is healthier than most good wheat-based pastas. This corn pasta looks interesting, but unfortunately if I want to try a package it will cost almost $10 including shipping! Maybe someday it will be more broadly available in local stores. I'm glad you found me, too! GF recipe development, especially with bread is extremely difficult. I just tried making homemade corn raviolis today, from scratch. It was a disaster! Try Chebe bread in the pouch. They have a web site: www.chebe.com Maybe I can borrow you as a recipe validator? The corn pasta, especially Le Veneziane is so worth it. I bite the bullet on a 1-year supply to easy the shipping costs. I spent about $48 for 12 boxes including shipping, which is 2x Trader Joes, but I find it's worth it, for me. 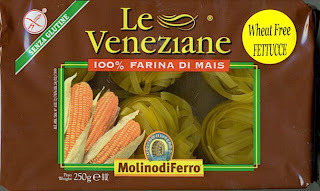 If you are fortunate enough to have an Italian grocer, see if they carry Italian made corn pasta. Hmm corn pasta, I haven't even been able to find this at Whole Foods. We buy the rice pasta and quinoa pasta, but I am going to have to try this! A customer of mine just pointed me to this blog. Thank you Erin for the endorsement ! Soon we will also be importing GF cereals & GF breakfast bars.